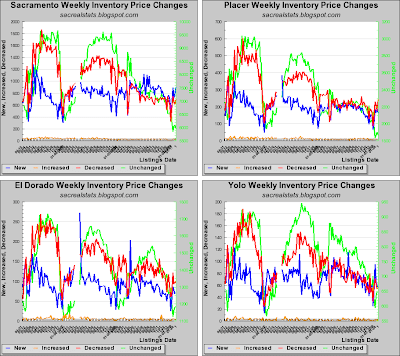 Inventory up just a little bit this week, but not a meaningful increase. 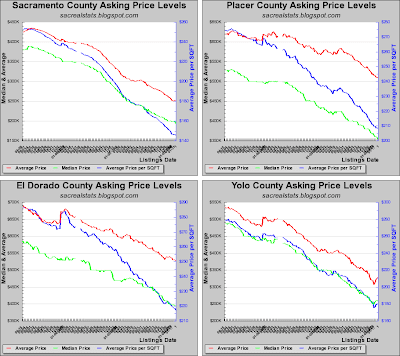 Interesting move in Yolo County, where asking prices are increasing. 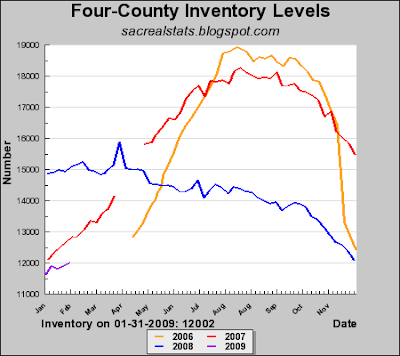 This is due both to a fall in lower-priced inventory and an increase in more expensive listings. Definitely a trend to keep an eye on. I noticed a lot of the big centex and KB houses in woodland are hitting the distressed sales. This is a change from all the small houses that made up the majority of the market. Not sure but they may be part of it. 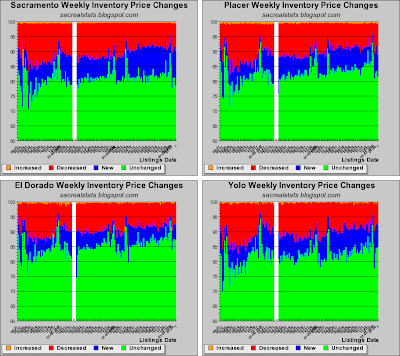 Call it the delayed Elk Grove effect. Then there are the overpriced crazies in Davis but mostly these are staying off the market and people wait for better times. 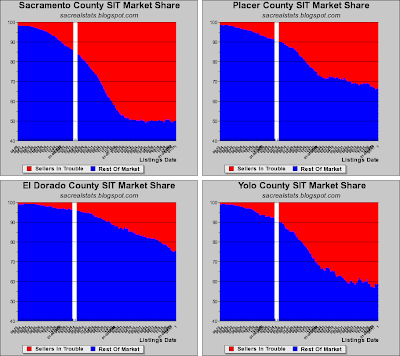 It may be indicative of nothing but why is the Sacramento County SIT Market Share chart soooo FLAT? No credit crunch, Stimulus plans, or Assembly bills have jiggled this value from the 50% mark since June. 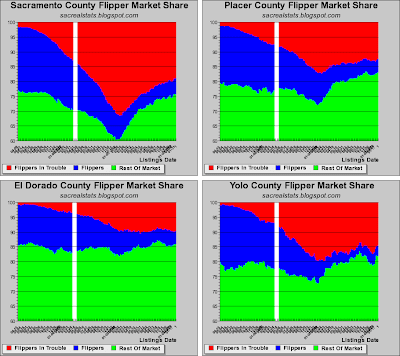 What drives SIT market share? 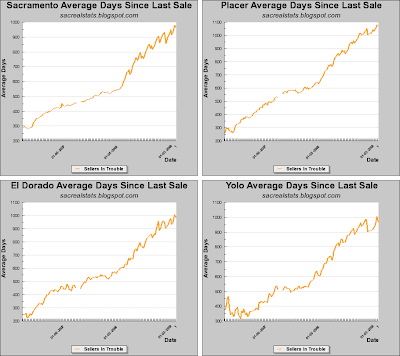 Is the data good? What drives SIT market share? Is the data good? 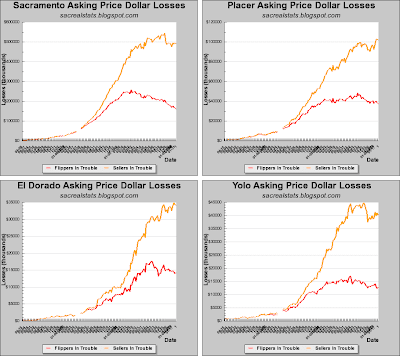 All this does is add up the losses current sellers are taking by comparing their asking price to the last time the house sold. The top-off is probably due to SIT capitulation: people who lost money on their house also owe more than they're worth, so they're letting them go back to the bank rather than offer them for sale at market price. I noticed a lot of the big centex and KB houses in woodland are hitting the distressed sales. Yeah, I see this as the opening salvo in the Alt-A default wave. 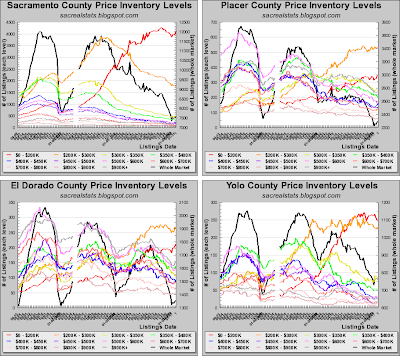 We should see an increase in aggregate market price indicators as the more expensive houses hit the MLS. No doubt the media will play this up as a sign of "recovery." 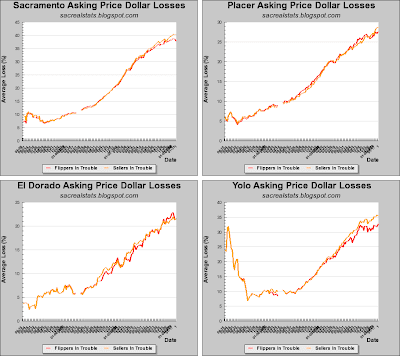 The top-off is probably due to SIT capitulation: people who lost money on their house also owe more than they're worth, so they're letting them go back to the bank rather than offer them for sale at market price." The only problem I have with that conclusion is it assumes people dont even TRY to sell. Maybe I am crazy, but before I go to default and ruin my credit, I would list my home and see if I could find a greater fool out there. 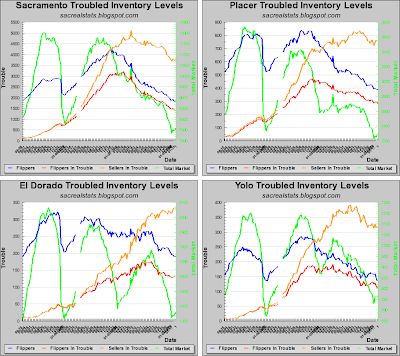 Sorry - in case it wasnt understood, I am saying most would try to sell, meaning their homes would show up on MLS, meaning inventory would have risen. Most real estate agents won't take a listing that's too far above market. Read some of my blog archives for extensive discussion on this topic. The market is in full capitulation. 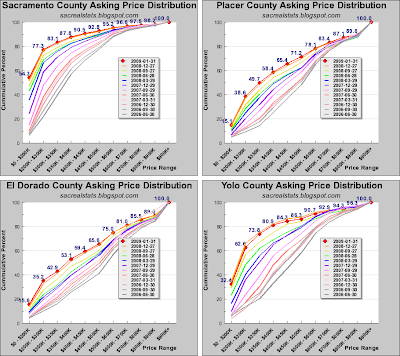 When people approach a realtor to sell, they do a market analysis. If those come back wildly negative, why put it on the market at all? Why not instead try to rent the house out at any price while waiting for the NOD and the sherrif? That way they can pocket the rent money and the deposit and just let the house go. I think that scheme is the only way left to make money in RE these days.